We know who was here first, but little evidence remains in Salmon Arm bay or valley of the aboriginal peoples' semi-nomadic life. They recorded events orally and only recently have we come to share and value their side of the story. The head of the lake, with its abundant wildlife, was a source of food, clothing and later furs for trading, but it was probably too densely treed and mosquito-ridden for permanent habitation. South-facing sites such as Sunnybrae or the more arid and open region of the South Thompson were preferred for winter quarters. On-going white contact resulted from fur-gathering; the Hudson's Bay Company is believed to have had a small post at Kault, while the late Max Bedford made strong case for the presence of another, perhaps earlier, trading post at Pierre's Point, run by a man named Snass. When the European concept of individual land ownership was arbitrarily introduced in the 1880s, the original inhabitants were relegated to a reserve existence scattered sites west of town, offering little or no fertile land. 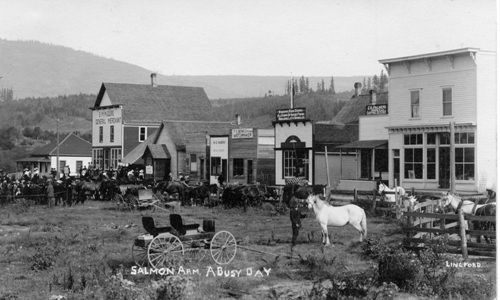 As far as a cultural settlement is concerned, Salmon Arm was one of the cities in the southern interior to be "opened up." Spallumcheen, Coldstream and Grande Prairie lay on or near the Bay's old Brigade Trail and were sparsely settled by stockmen as early as the 1860s. A wagon road followed, giving the Okanagan Valley a reliable connection to Kamloops beyond. During the short-lived gold rush on the Columbia River in 1865, the main force of miners and hangers-on- traveled to the trailhead at Seymour Arm (Ogden City) via Thompson River and Shuswap Lake, but Salmon Arm's lakefront lay virtually ignored. After the gold petered out, years elapsed before water transport picked up again, when farmers in the Spallumcheen sought an outlet for produce. Accounts of exploration around Salmon Arm in pre-railway days are rare. One is found in Blazing the Trail through the Rockies which contains a mention of Walter Moberly’s trip along the south of Salmon Arm and across by raft to Tappen Bay. Rumours that the CPR would bridge the lake from Engineer’s Point to Sunnybrae influenced T.H. Hatherly and his son James to homestead on the north side in 1885; thus they became the first white settlers in this area. “We found our way by Arm to mouth of Salmon River, all the creeks we ascended and washed in them pans of gravel, sunk a few holes, none deep, found no gold, but in one place a few light colours. Some Indians, on Techaskett, tried to explain where he saw shiny sand and gravel on the shore of the lake a distance off, southeast from Salmon Arm. Our curiosity led us to search for the place. We followed the arm of the lake to Sicamous." (Fortune wrote his story years after the fact, when modern place names had been adopted). Track layers passed through Salmon Arm the first week of September 1885 and now the city was accessible to the world. Some pioneers couldn't wait for the beginning of rail service. A. J. Palmer was said to have beaten the train by making the journey from Calgary on foot through the mountains on the CPR grade. With no bridges, yet crossing gullies and streams, his progress was dangerous and prolonged. Palmer established himself at Salmon Arm West, as did most of the farming vanguard. Soon, names like A. J. Hedgman -- first to claim residency west of the railway station -- Carlin, Settle, Dalton, McGuire, Fraser, Shaw and Lund turned up in local affairs. Salmon Arm officially began in 1890, when residents successfully petitioned the federal government for a post office. William's Directory for 1890 lists Salmon Arm as being "a station on the main line of the CPR, 319 miles east of Vancouver and 33 miles east of Shuswap. Mails daily "Bradstreet's Report of the Dominion of Canada, 1893”, pegged the local population at 28. The early settlers preferred the rich valley bottom land to the higher benches, which they deemed worthless without irrigation. When fruit growing started to attract widespread interest in the BC interior, most of the initial planting was done in the valley. However, the trees weren't happy there and as fruit production assumed larger importance, the well-drained benches came into their own. Berries and vegetables were also tried in the valley, but dairying and mixed farming gradually became dominant. Until outstanding timber claims, Native land allotments and other matters were dealt with, the first farmers only had squatters' rights to the land they selected. After Indian reserves were laid out in 1884-85, followed by initials township surveys at West Salmon Arm 1887, the hunt for homesteads started in earnest. The one factor which characterized land activities here was a relatively small land base, as compared to the large, easily cleared tracts so loved by the early development companies and readily obtainable in the Okanagan Valley. In 1890 the province sent a man to oversee construction of a road from the Valley to the CPR station and a bridge of the Salmon River, with authority to spend up to $500. The funds ran out before the project was completed, but volunteers closed the gap with a corduroy section just west of the village. Next came a southern branch, starting from Hedgman's Corner (30th Street SW or Harbell Road), followed by the Gleneden road in 1896. An 1898 geological survey map traces the Gleneden route and also shows Foothill Road already in use. The Old Enderby Road was voluntarily built from Larch Hill corner to Gardner’s Lake in 1986, mainly to ease the procurement of flour and feed. Getting to Kamloops entailed a precipitous climb over Kault Hill and time-consuming trip over the old Skimiken trail, along Chase Creek and down to Shuswap. The other choice was to take the train, or make the roundabout trek to Silver Creek, where the trail led to the Vernon-Grande Prairie-Kamloops wagon trail. The year 1894 is remembered for flood and fire. During the spring runoff Shuswap Lake inundated at least half the valley, covered the railway east and west of town and created a miniature lake between Alexander Avenue and Ross Street. Then in July a fire broke away from a smouldering slash pile at the base of Mount Ida and swept through the valley, destroying livestock, crops and buildings. Salmon Arm attracted serious attention as a fruit-growing city as early as 1904, when the farmers’ institute sponsored well received exhibits at both Kamloops and New Westminster. Hudson’s Bay Company capped the effort by displaying the entire local display in the windows of its Vancouver store. Producer interests had been partially served since 1896 by a farmers’ association, and by a local fruit growers’ organization formed in 1897, with 32 members. Thanks to A.J. Palmer, who was credited with the originating the practice of displaying produce and stock, the first horticultural exhibition held in Salmon c.1897 was a smashing success. A proposal was made to form a processing and marketing facility in 1904, but it took another three years before Salmon Arm Farmers’ Exchange was ready for business. The men largely responsible for getting it off the ground were L.B. Pangman, F.B. Howarth and J.W. McCallum. Through good times and bad the Exchange held sway as "the greatest farmers' commercial organization in this city," Ernest Doe wrote in his History of Salmon Arm. "Efforts to establish a local creamery failed to generate much enthusiasm when the idea was first proposed in 1907, not surprising considering the volume of fluid milk shipped from Salmon Arm at the time. The large shippers had developed a ready market for raw milk and were not easily persuaded that better returns could be had from local butter manufacturing." Formal local government came May 15,1905 with the proclamation of Salmon Arm Municipality, after a majority of residents signed a petition advocating incorporation. All members of the first council, including Reeve J.H. Harbell, were elected by acclamation. Better and more roads topped the wish list of persons who favoured incorporation, not to mention a policy for controlling noxious weeds. W.J. Kew had charge of all roads west of Sam McGuire's store and W.W. Currie was responsible for roads east of that point. The following year Mrs. Agnes McGuire created the first townsite subdivision on 12 acres. At the end of year one ward system was adopted by council and in so doing it created a climate of factional rivalry, mostly over allocation of tax revenues. Breakaway movements hindered councils for years to come and ultimately charges the townsite was continually receiving more than its share of public works money led to formation of the City of Salmon 1912. City incorporation was also hastened by agitation for electricity and a water system, while ratepayers outside the town continued to complain about bad roads, some even considering a return to provincial status. The dispute reached boiling point when it was proposed to borrow $75,000 for road improvement and $25,000 for town water system. Wrangling over expenditures ward-by-ward and further calls for secession convinced city proponents their time had come. The committee struck to investigate pros and cons of urban status gave thumbs up to the movement and after a petition with the required number of signatures had been gathered, provincial approval was granted March 12, 1912. R. K. Scales won election as the first mayor--unopposed. Was it all worth it? Ernest Doe concluded it was the only way: "An alternative scheme, the local improvement city, was suggested, but even if a law to borrow sufficient money received the consent of taxpayers, much disagreement as to distribution of funds would have ensued........The rosy picture painted by the fervent supporters of incorporation was not realized, partly owing to conditions beyond their control and the estimated cost of running the city was set too low. Still (setting up independently) gave them the utilities it desired." After the major growth spurt of 1905-12, Salmon Arm's economic health suffered a setback with the general downturn of 1913 and subsequent start of WW1. Bereft of incoming capital and settlers, the community marked time until just after the second half of the century. In retrospect it has been argued the early promise of carefree fruit ranching contained hopes which could never be fulfilled. "Non Irrigated" didn't always mean sufficient moisture and the advertised loamy soil often turned out to be sand, too rocky or unrelenting clay with a thin band of fertile soil on top. Quarter-section homesteads were subdivided and re-subdivided, as promoters predicted a comfortable living could be had from as few as five acres "of the right sort." In reality, it usually turned out to be nothing more than subsistence agriculture. Whereas the Valley generally attracted practical, experienced farming types not afraid to roll up their sleeves, the notion of fruit ranching often took hold in the imaginary mind of Englishmen serving the Empire in such faraway outposts as Manchuria and India. Some sons daughters of the moneyed class thought life in the Canadians West struck just the right balance between work and play. Perhaps it was so for a few, but most were ruled by hail, heat, insects, plant diseases, unscrupulous middlemen, the CPR and the dispassionate market. Then, just when rising economic hopes seemed justified, the Great Depression spread over the land. No matter what their bank account said, the English expatriates stuck together trying to approximate life in the Old Country as closely as possible. Many homed in on South Canoe it was soon dubbed Little England by “the other half." The electric age dawned here in l913 with the start-up of a city-owned plant utilizing a diesel motor considered a lower cost option to a coal-fired systems. A unique feature of the service was free use of one verandah light for the next eight years. Salmon Arm became part of the West Canadian Hydro Electric Company grid in the fall of 1928. On January 13, 1914, Mayor Scales presided at a valve-turning ceremony for a new city water system. A few months later a rare show of city-city co-operation resulted in service being made available to 20 homes on the Limit (Broadview). A comprehensive joint system would not be realized for another 33 years. In the summer of 1945 the province conducted a survey, which resulted in a suggestion local domestic and irrigation interests merge. It also proposed water pumped from Shuswap Lake combined with gravity supplies to fill both irrigation ditches and household pipes. Elated fruit growers immediately formed a water city and the sitting joint water committee stood down in favour of the new body. While consideration was being given to the Hunters Range scheme, a well as to a proposal to seek funds under the provisions of the Prairie Farm Rehabilitation Act, interests favouring only a domestic system succeeded in strangling the more ambitious undertaking. Within three years every resident in the city was able to enjoy a reliable source of water. Only the orchards went thirsty. The 1950s saw lumber and plywood manufacturing take up some slack in the local economy, as former fruitlands yielded to small holdings and residential subdivisions. Tourism was starting to take off and Salmon Arm was becoming known as a desirable retirement centre. The school district also emerged as a major employer. It has always been hard to put a finger on Salmon Arm's economic mainstays, in light of there being few major employers over the last 100 years. Mayor Harold Scales probably put it best when he told interviewer in 1945, "Oh, we all take in each other's laundry."